The field for this weekend’s men’s college basketball Final Four is set. Here’s a quick look at the Elite Eight games that served as the springboards. 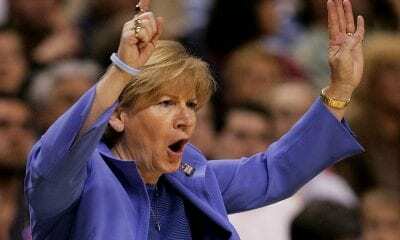 The consensus favorite to win the national championship, it just seemed from the start Duke was on borrowed time, especially when it had such a tough time with Central Florida in the second round. The Blue Devils struggled to take every step up the ladder, even before they reached their Elite 8 game against Michigan State on Sunday. So when Spartans guard Cassius Winston dribbled out the clock, eliminating the No. 1 overall seed in the tournament, some may have simply thought what took so long? Now we wait to find out if Duke’s heralded freshmen class, led by the incomparable Zion Williamson, does the one-and-done thing and heads to the NBA Draft. Another of those guys, R.J. Barrett, missed a free throw in the final seconds against the Spartans that at least might have helped Duke into overtime. What’s certain is, Duke wasn’t good enough to hold back Michigan State, an injury-riddled team that persevered with grit and determination. The play of Winston, especially after the loss of junior Josh Langford in December, junior forward Nick Ward and junior guard Kyle Ahrens, can’t be underestimated. Winston has made up for his athletic shortcomings by bringing a sharp mind for decision-making into play. His assist-to-turnover ratio is 2.56 to 1 and he led the Big Ten in assists and, eventually, the postseason tournament title. On Sunday, Winston had 20 points, 10 assists and just one turnover. That type of performance, under that much pressure, is irreplaceable. When Chuma Okeke was taken off the court with a torn ACL in the late moments of Auburn’s surprising win over North Carolina on Friday night, you had to figure the loss would catch-up to the Tigers on Sunday against Kentucky. It did, but in the best way possible. Instead of draining the spirit from the team, it inspired them to an improbable 77-71 overtime win over the Wildcats. The major adrenaline boost came early in the second half when Okeke, in his wheelchair, was positioned behind the Auburn bench to be with his teammates. That was all the Tigers needed. How can you bet against Auburn (in states where it’s legal, of course) after it has already chipped three-thirds of basketball’s Mt. Rushmore – Kansas, North Carolina and Kentucky – off the mountainside? 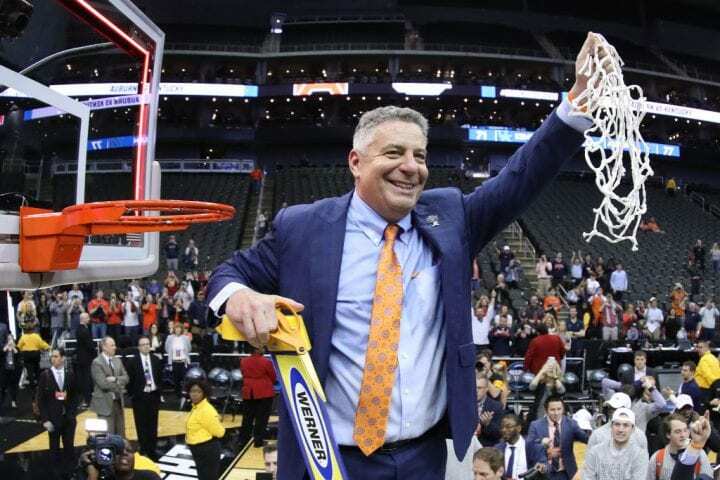 Coach Bruce Pearl may be controversial, but he also has his program thinking a national championship is within reach. With no option but to adapt for the loss of Okeke, their top rebounder, and with Kentucky star PJ Washington back in the lineup, Pearl did some manipulating. He mixed and matched his four remaining big men to try and minimize the advantage Kentucky would likely have on the boards. And he asked his other guys to fight and scratch. Washington scored 28 points with 13 rebounds. But no one else on Kentucky really bothered the Tigers. And Auburn had Jared Harper making up for that with 26 points, five assists, three blocks and two steals. With prized alumnus Charles Barkley sobbing from the television studio, the Tigers, who have won 13 of 14 and 11 straight and take almost half their shots outside the three-point line, will head to their first Final Four. During a weekend of pulsating games, it was hard to match the excitement during the second half of the Cavaliers overtime win, which takes them to the Final Four for the first time since 1984. Virginia, which lost to a 16 seed in the first round in 2018, had to deal with the superhuman performance of Boilermakers guard Carsen Edwards. He was draining threes from Steph Curry range, off-balance and tightly guarded most of the time. Edwards made 10 three-pointers and scored 42 points, counterpunching each effort the Cavaliers made to put distance between them. Edwards set an NCAA Tournament record with 28 treys (in just four games) and became the first player to be picked regional MVP from a losing team since Curry in 2008. The reason Edwards had to work so hard is that his counterpart, Virginia guard, Kyle Guy, was having just as spectacular a game. He made five three-pointers to lead the Cavaliers with 25 points (21 in the second half) and that was after he appeared to roll his ankle in the first half. When Edwards banked home his final three to give the Boilermakers a two-point lead with 1:08 to play, Virginia had to figure it out for good. Up by three, Purdue fouled Ty Jerome, who scored 24, with 5.9 seconds left. He made the first, missed the second, but the Purdue controlled the offensive rebound. Freshman Kihei Clark ran the ball down in the backcourt and somehow found teammate Mamadi Diakite with enough time for him to beat the buzzer and tie the game. From the Day One of the tournament, Texas Tech has benefitted from a small, but dedicated group of supporters convinced its savvy and defense could take it to the Final Four. You can add Gonzaga to the list. 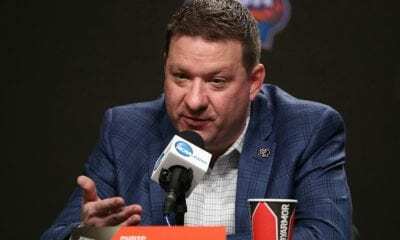 The nation’s top offense was left bewildered by the tenacious Red Raiders who advanced to the Final Four with a clinical dissection of the Zags, who were held without a field goal at one point for 12 minutes. Imagine all those voters who picked Tech to finish seventh in the Big 12’s preseason poll. Of course, there was a good reason people may have doubted the Red Raiders and coach Chris Beard. They lost three of their top four scorers from last year’s Elite Team, including first-round NBA draft pick Zhaire Smith. When a team loses so much so quickly it’s easy to jump off their bandwagon. Still, it seemed short-sighted. Texas Tech has developed an institutional flair for stopping the other team, which has and will always make it a threat. And now they have their first Final Four appearance to show for it. In the last 20 years, only UConn in 1999 has won the national championship in its first try. How did this happen?The Red Raiders, who have lost only once since Feb. 2, filled in the gaps with a grad transfer from South Dakota, Matt Mooney, a transfer from St. John’s, Tariq Owens, and a kid from Italy, Davide Morretti. And it all seemed to mesh when they were paired with the team’s best player, Jarrett Culver. Beard is one of the nation’s most underrated tutors. 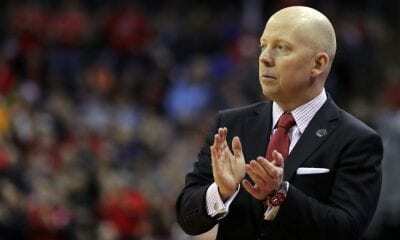 He’s in just his third season at Texas Tech and he makes $2.8 million, which is 28th among NCAA Division I coaches. But he’s about to make a whole lot more.